Thor: The Dark World starts off with Loki being sentenced for his crimes on Earth. We then catch up with Jane Foster trying to get on with her life after Thor has seemingly left her behind. She stumbles across something called the Aether, that Odin later reveals is an infinity stone. The reality stone, to be exact. The Aether’s appearance awakens the dark elf Malekith, who wants it to restore the universe to darkness. Through a series of events we get an awesome Thor and Loki team up…but unfortunately, that’s about all that’s awesome. The plot of this film is a little too thin and really borderlines on the “I’m gonna shoot a laser in the sky to destroy the world” trope. Now sure, Avengers had the portal, but the film had stakes, a really good setup and along with a compelling villain it didn’t feel empty or lazy. The Dark World feels really empty on the villain’s development and the stakes never really feel very high. Funny thing is, with this movie I still enjoyed watching it. Part of the ‘problem’ is the MCU has had such a high standard so anything less than amazing stands out as being sub-par. This isn’t a bad movie, it just has a lot of issues with plot and character. The main problem I think has to do with the villain Malekith. He doesn’t have enough motive for me, there’s nothing behind why he wants to return the universe to darkness. There should be SO much more to him and he should feel like a threat, especially because…SPOILERS… he kills Thor’s Mum. Malekith just never feels intimidating, he has loads of cool visuals but overall the way his character was written that made him fall flat. 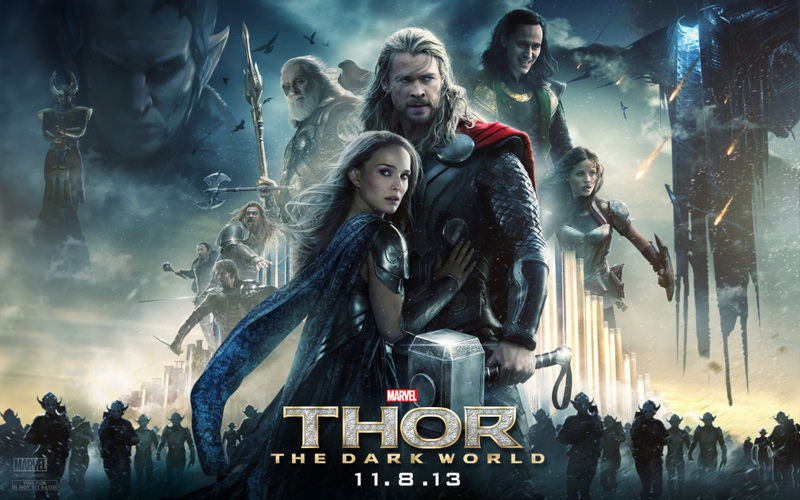 The Asgardians really save this film for me, Odin strong as usual, the warriors three are always fun. The MVP though is absolutely Loki, He had great character development, acting like he doesn’t care about his adoptive family, but you really feel his relationship and love for his mother Frigga. Loki just steals this movie in every scene and as always you never know which side he’s on. The way Thor and Loki play off each other is so fun to watch and it’s where most of the fun in this film comes from. The Human crew is also really fun to watch, I love especially what they did with Erik. I think where this film falls apart is its villain and ultimately it lets the whole thing down. By the end of the film, you don’t feel a weight of what they have just been through. Thor and Loki suffered a huge loss in Frigga, That funeral scene was stunning to watch, the score in that part really hit me. Thor also thinks he lost Loki too, that should be a huge gut punch. Although he had loads of potential, there wasn’t enough time or development spent on Malekith and his ultimate goal of returning the universe to darkness just doesn’t hit me at all. That really makes the film fall apart.